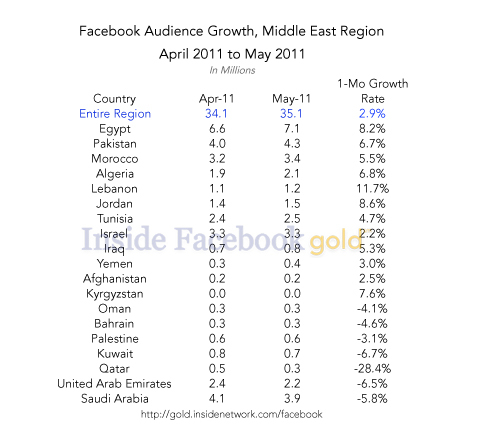 A new article released on Inside Facebook today gives an interesting look about the traffic on Facebook from the Middle Eastern countries. And although there were upto 7 countries which have gained 100,000 users in the past month there is a bit of surprising and unexpected loss of users in a couple of the major countries of the region. Below is the chart prepared by Inside Facebook, as you can see Egypt is leading the pack with 500K users as previously reported here. Lebanon and Jordan both have gained 100K users in the past month giving them an impressive 11.7% & 8.6% gain which are the highest percentages in the region. The surprise comes at the bottom of the list where all of UAE, Saudi Arabia and Qatar had a loss of around 200K users in the past month. Translating into a monthly growth deficit of 6.5% for the UAE, 5.8% for Saudi Arabia and a whopping 28.4% for Qatar. I think we can safely assume the reason why Egypt is gaining popularity and users, but why are users shying away from Facebook in Saudi, UAE and Qatar? There hasn’t been any changes or regulations imposed (at least in the UAE or Qatar) to suggest the loss of traffic, could it be that Facebook has plateaued in the UAE? Would it be possible to lose more traffic in the future from these countries? I believe it is possible in the UAE, but I don’t think it will go under the 2M user mark which would still mean that a good percentage of the UAE population is on Facebook, however Saudi Arabia has a long way to go because it has a much bigger population and I think with time traffic will keep fluctuating and eventually rise. What do you think, if you believe you know why traffic has gone down in the key countries mentioned above let us know?